IT practitioners are taught since infancy the benefits of standardizing hardware. The “homogeneous doctrine” promises that sticking with one manufacturer and one model will make life so much easier. Easier to manage for sure, but is it effective, even practical? Is strict homogeneity in the best interest of the company, or its clients? Consider storage. Are you willing to pay the same price per GB for rarely touched archives as for inflight sales transactions? Of course not. The time value of data deteriorates rapidly. It would be irresponsible for you to tie up an expensive All-Flash Array (AFA) with relatively dormant bits. Yet many accept the wasteful practice because it’s impossible to manually decide, much less relocate data according to its age. Your monotheistic preferences notwithstanding, the varied nature of workloads and data relevance begs for a multi-tiered approach. This explains the many storage alternatives tailor-made for specific stages in the information life cycle. The lightning fast flash cards for got-to-have-it-now response. The middle of the road storage arrays, good enough and reasonably priced for more mundane access. And the outrageously cheap cloud options for seldom-touched files at the other extreme. Understandably, the thought of juggling such a mixed bag of resources incites much anxiety and apprehension. Perhaps I can allay your concerns, and invite you to embrace diversity. A good chunk of DataCore customers already do and reap the savings year after year. Some like you were searching for ways to replace disparate arrays with one consolidated storage system. Instead, they came away putting those differences to good use. Through machine learning, aging data blocks progressively migrate from AFAs to cheaper midrange systems without any manual intervention. The storage virtualization software spanning different makes and models sensibly chooses the best holding area according to site-specific policies. Needless to say, these customers’ shopping habits have also changed – actively prioritizing diversification over commonality for considerable cost reductions. Check out the video below as it puts their transformation into perspective! 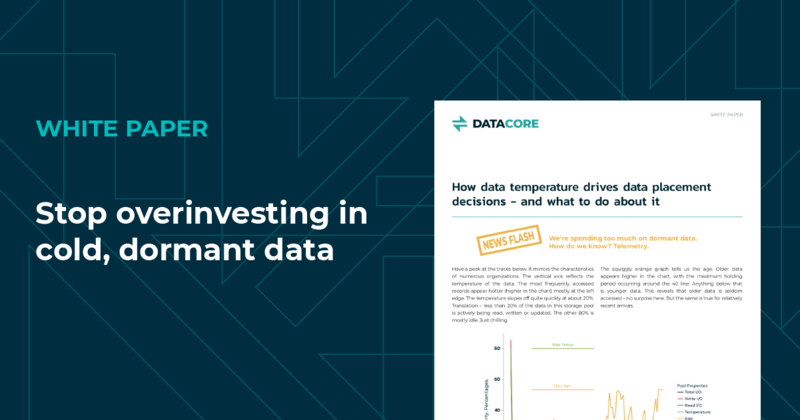 Want to learn more about hands-free data migration from premium to lower cost storage as it cools?